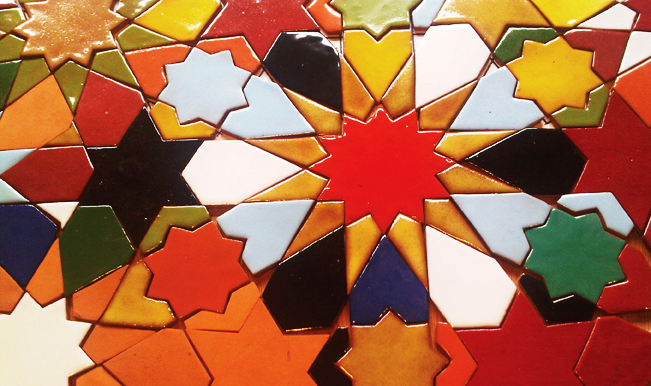 The makers of the Alhambra were artists, artisans and scientists, all rolled up in one and the Alhambra Tiling Project aims to reaffirm this spirit of plurity. On the simplest level, the work shows ways in which a variety of different shapes can fit together to make an integrated whole, an expression of unity within diversity, which may be taken as a metaphor for social integration and inclusion. The patterns that connect ideas can also bring together different sorts of people, across divides of age and race, towards a common co-operative and creative goal. The patterns are also interesting in terms of the theory of art and the practice of craft. A tile is a tangible thing formed by hand from earth and wrought by fire until it turns to stone. The durability of ceramic art enables us to communicate with our ancestors and leave messages for future generations. This can be a commercial endeavour, if one hundred people each make ten tiles then suddenly a thousand tiles have sprung to life. Unit's that can be fitted together like jigsaw pieces so that they form an integrated whole.